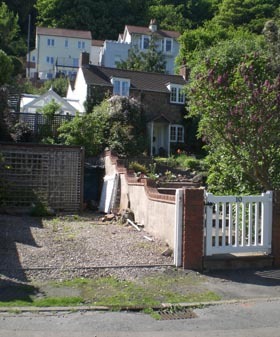 Location: Spring Cottage, 10 Lower Wyche Road, Lower Wyche. 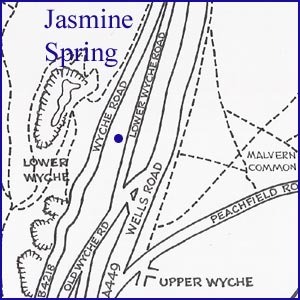 Description: a spring rising as the rear of Spring Cottage and visible in a grille in the road before entering a crude spout and basin on the other side of the road. 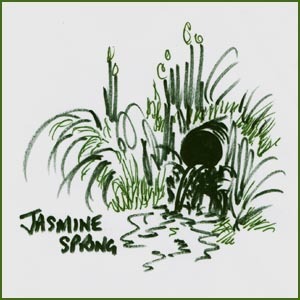 Spring Cottage, known until the early 1980s as Jasmine Cottage, has a spring in the garden. The spring is in a wet hollow at the side of the cottage. This would account for some of the water which runs through the roadside grille but not all, so it seems likely that other similar sources have been contained in the immediate vicinity; it is believed that a spring exists at No. 20 Wyche Road. The water runs beneath Lower Wyche Road and is then contained in a crude spout and basin. From there it runs downhill in an open rill flowing beneath the Wells Road, where it eventually ends up in the pond on Malvern Common. This pond is also used to take surplus water from the Severn Trent Water reservoir at Lower Wyche. The Lower Wyche reservoir was built in 1854 by Malvern Parish and is the oldest reservoir in the area still in use. It holds one million gallons and is fed by three springs in the Rushey, Wide and Firs Valleys and now supplies the collector main which runs along the Wells Road. Some years ago there was a move to fence the Firs reservoir but this was resisted by the Malvern Hills Conservators. Malvern Advertiser 5 Oct 1867 - The water tanks at the Wyche had sand in them and needed cleaning out. It was decided to clean them out and paint the railings at a cost of UK pounds 4,000. Malvern Advertiser 22 Nov 1873 - At every meeting of the Board a sheet of paper was placed on the table showing the amount of water in the tank. The amount in there was frequently checked but amounts differed quite widely from one week to the next, output from the hills was too variable to monitor predictably. The turncock flushed out the debris from the old pipes every quarter in the mid 1970s and turned off the water supplies when maintenance work needed to be done. The fire brigade used to test the fire hydrants and in doing so caused iron to get from the pipes into the main water supply, thus turning the water brown. 1. The crude spout and basin on the eastern side of the Lower Wyche Road. 2. The rill that feeds the pond on Malvern Common in the 1990s. 3. The site of the spring and roadside grill at number 10. Malvern Gazette, 20 November 1992 "Call to Fence Off Tanks". Click on Website below or the top banner to go to the Site Index.